Natural Herbal tea remedies are growing in popularity thanks to research and publicity surrounding their natural health benefits. There are a vast array of herbal tea flavours available to health conscious consumers especially those looking to detox or cleanse their bodies. Many herbal tea remedies serve two purposes: firstly as a medication and support for the health of the body and secondly as a natural drink. Each herb has a distinctive taste and specific health benefit. When you drink a cup of herbal tea, you are actually consuming a herbal infusion, also known as a tisane. Herbal infusions look like tea and are brewed in boiling water like tea. Herbal teas are made from a mixture of dried leaves, seeds, grasses, nuts, bark, fruits, flowers or other botanicals that give them their taste and natural healing properties. Herbal tea remedies are available as loose herbal tea or herbal tea bags. Once the water has boiled, add one heaped teaspoon of herbs or one tea bag for every cup of water. Cover and let the herbs steep for 10 minutes. Do not over-steep the herbs as the flavour may become too strong and taste medicinal rather than pleasant. If you want to enhance the flavour of your tea, honey or lemon are good choices. provide protection from free radicals due to their antioxidants because of the polyphenols they contain. Below are some of the more popular herbs and botanicals found in herbal tea remedies. This list is small compared to what's available and the descriptions are brief. The effectiveness of most natural remedies seem to depend on the response of the individual and while one person will rave about the benefits of ginger tea for nausea and cramps another person may experience little relief. Allspice is said to help soothe the common cold and relieve upset stomachs. Borage is similar to Comfrey, but without the bad reputation. It can help lift mild depression. Chamomile tea is a popular herbal tea remedy known for its sedative attributes and research points to a host of anti-inflammatory and anti-spasmodic properties. It can be used safely for little children and tense individuals. Many people drink it at night before bed to help with falling asleep. In the case of digestive complaints it has the effect of separating the brain from the stomach so that the digestion proceeds normally despite our worrying. Cinnamon has a calming effect and is thought to support healthy circulation and digestion and to balance blood sugar levels. Dandelion aids digestion and the liver. The leaf is a diuretic rich in potassium, as can be seen in its French name, Pissenlit. Feverfew is a useful tea for headaches and at the onset of colds. Fennel Tea is for ailments such as long-term constipation and diarrhea, indigestion, flatulence, urinary disorders, coughs and bronchitis, and for its ability to increase the flow of milk in breastfeeding mothers. Applied as an eye lotion or compressed, cooled fennel seed tea is helpful for minor eye complaints such as irritation and morning puffiness. It is also beneficial for treating bruises, dull and oily skin, gum infections, bad breath, Get Rid Of Cellulite, muscular and rheumatic pain, digestive upsets. Also one of the best herbal tea remedies for menopausal symptoms and PMS. Fennel tea is well known for its ability to reduce bloat and relax the intestines caused by digestive disorders. Fennel is a common ingredient in gripe water used to help babies with colic and flatulence. Ginger makes a wonderful herbal tea when the fresh rhizome is sliced into boiling water. It reduces nausea and cramping tummy aches, including menstrual cramps. Together with Dill, Fennel, or Anise it forms a component of ‘Gripe Water’. Drink it in a hot toddy together with Elderflowers, Yarrow and Mint at the beginnings of a cold. Ginseng stimulates vitality via the adrenal glands and helps the body stay healthy. Green Tea Health Benefits University of Purdue researchers recently concluded that a compound, catechin polyphenols, particularly epigallocatechin gallate (EGCG), is a powerful anti-oxidant. Besides inhibiting the growth of cancer cells, it kills cancer cells without harming healthy tissue. There is also research indicating that drinking green tea lowers total cholesterol levels, as well as improving the ratio of good (HDL) cholesterol to bad (LDL) cholesterol. Why don't other Chinese teas have similar health-giving properties? Green, oolong, and black teas all come from the leaves of the Camellia sinensis plant. What sets green tea apart is the way it is processed. Green tea leaves are steamed, which prevents the EGCG compound from being oxidised. 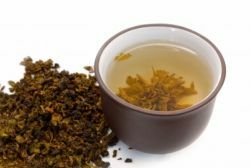 By contrast, black and oolong tea leaves are made from fermented leaves, which results in the EGCG being converted into other compounds that are not nearly as effective in preventing diseases. New evidence is emerging that green tea can even help dieters. Researchers found that men who were given a combination of caffeine and green tea extract burned more calories than those given only caffeine or a placebo. Green tea should not be drunk at night as it contains caffeine, although only 20 mg per 250 ml. Hawthorne has been used to strengthen the heart and increase blood flow to the extremities, warming up cold feet and hands. Lemon balm, also known as Melissa, was said by Culpeper in the 17th century to renew youth, strengthen the brain and prevent baldness! It has a pleasant taste. Bees love it too. Lemongrass is used frequently in teas for its calming properties. It smells and tastes wonderful and induces restful sleep. Parsley has a diuretic effect and is purported to help reduce uric acid levels. Peppermint herbal tea is thought to have greater stress-relieving attributes than chamomile tea and to help with stomach and digestive issues. It also helps to freshen the breath. All the mints are carminative, i.e. they reduce gas and rumbling of the gut. Pennyroyal of the mint family should not be drunk in excess as it can bring on menstruation. Rooibos tea is one of the best herbal remedies that can be enjoyed as a refreshing drink.It has no caffeine and is low in tannin, so it can be enjoyed all day long without any unpleasant side-effects. This also makes it a great tea for pregnant women and nursing mothers. Its health benefits include easing irritability, headaches, nervous tension and insomnia. It also acts as an anti-spasmodic agent, to relieve stomach cramps and colic in infants, and it can be used to treat hay fever, asthma and eczema and to boost the immune system. Rooibos tea contains no oxalic acid, so people who are prone to kidney stones can consume it safely. There are so many minerals in the tea that it can almost be considered a nutritional supplement. These include copper, iron, potassium, calcium, fluoride, zinc, manganese, Alpha-hydroxy (great for the skin) and magnesium. Rosehips are often combined with Hibiscus leaves making a red-coloured tea rich in vitamin C.
Rosemary herb tea is mood-elevating and energising, sending blood to the brain, aiding memory and healing liverish headaches. It should be used sparingly if one suffers from very high blood pressure. Sage tea is strong and not very pleasant-tasting but can be very effective in reducing the heavy perspiration of night sweats. It contains oestrogenic steroidal compounds. Sarsaparilla is said to promote energy and healthy skin. Slippery elm has properties that help relieve stomach cramps and other gastrointestinal problems. If you are interested in taking herbal tea for medicinal purposes, make sure you familiarise yourself with the composition of your herbal tea remedy mixture. Most herbal remedies are safe, always check with your health practitioner to ensure that the herbs you are consuming are appropriate for your health status and do not cause a problem with your prescription medication.